By using the services of the Agency, Clients automatically agree to the Terms and Conditions as stated below. 1.1.1. 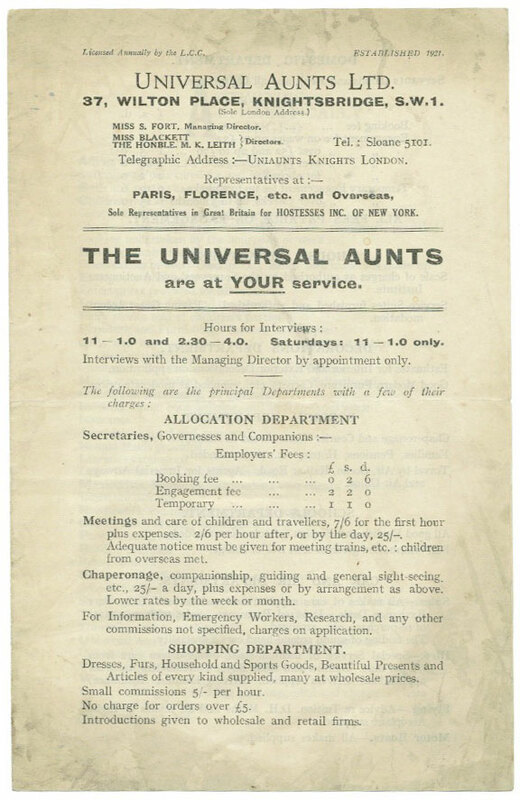 Agency: Universal Aunts Limited, a company registered in England and Wales with company number 00185178. 1.1.2. Client: an individual who as a direct or indirect result of the actions or services of the Agency, makes contact with an Aunt purposed or leading to an Engagement, whether for the Client or someone else. 1.1.3. Aunt: a person known to the Agency and recorded in its register of persons seeking Engagements, who is introduced by the Agency to the Client for the provision of the Aunt’s services. 1.1.4. Introduction: the introduction of an Aunt for a position of support to or employment by the Client, or such other services as may be provided by the Agency to the Client. 1.1.5. Engagement: the acceptance by an Aunt of an engagement by the Client for provision of support services to the Client, or commencement of such work. 1.1.6. Agency Fee: the fee to be paid by the Client to the Agency in accordance with normal terms of business as set out in the Agency’s brochure and/or Fees Table applicable at the time of the Engagement in payment for the introductory or other services provided by the Agency. 1.1.7. Fees Table: the Table of tariffs and fees charged by the Agency in return for Introductions or other services, published on the Agency’s Website, in its Brochure, or as an independent document, as varied from time to time and applicable to such periods of time as the Agency’s Directors shall decide, at their exclusive discretion. 1.2. These Conditions are incorporated or implied in any agreement between the Agency and the Client and govern all Introductions or Engagements undertaken by the Agency. No variations of these Terms and Conditions will be binding unless expressly confirmed by the Agency in writing. 1.3. The Agency is an introductory agency and does not employ Aunts, who are engaged by the Client on whatever terms are agreed between them. All issues and obligations by the Client to the Aunt and vice versa are their own responsibility. 1.4. The Aunts work on a self-employed basis, directed by the Client or the Client’s representative. 1.5. The Agency cannot be held responsible for any losses, costs, claims, damages or liabilities of the Client and/or any child, associate or dependent of any Client or of any Aunt arising from or causally connected with an Introduction or Engagement of any Aunt. 2.1 The Agency’s fee is applicable to one Engagement and the fee for any further Engagement(s) of an Aunt returning at a future date (re-Engagement) will be charged to the Client at the rates stated in the Fees Table applicable at the time of the re-Engagement. Should any Engagement or re-Engagement occur without notification to the Agency by the Client, the Agency reserves the right to charge the applicable fee. 2.2 Fees to the Agency are payable by the Client, at the rates and/or in the amounts set out in the Fees Table, prior to the start of an Engagement, or first commencement of work by the Aunt, and are solely in payment for the introductory and other services provided by the Agency. 2.3 The Agency reserves the right to amend its fees from time to time and will notify the Client accordingly. 2.4 In cases where the Aunt has been engaged for an agreed period and the Engagement continues for a period longer than that for which the fee has been calculated, or on a permanent basis, the Agency must be notified and additional fees applicable to the longer or permanent Engagement will be charged. 2.5 If a temporary Engagement becomes a permanent Engagement, the full fee applicable to an introduction for a permanent Engagement becomes due and additional fees applicable to the longer or permanent Engagement will be charged. 2.6 If a Client engages an Aunt for a temporary period and then engages a further Aunt on either a permanent or temporary basis, this will be treated as a new, separate Engagement. 2.7.1 the Client engages, or uses the services directly or indirectly of, any Aunt. 2.7.2 the Client is directly or indirectly involved in the referral, introduction, recommendation or passing-on of information about any Aunt to any person, firm or corporation (“third party”) resulting in an engagement, whether permanent or temporary, of that Aunt by the third party for which fees would otherwise have been receivable by the Agency. 2.8 In the event of the Client not paying the Agency fee, the continuation of the Engagement will be a breach of these Conditions entitling the Agency to all such rights and remedies as may be appropriate, including an injunction, damages and/or costs. 3.1 The Client agrees to take all reasonable measures for the welfare and wellbeing of the Aunt, exercising appropriate courtesy and consideration in all interactions and, in the event of any engagement on a residential basis, providing a clean and comfortable bedroom and full board for the duration of the Engagement. 3.2 The Client agrees to pay for all the Aunt’s out of pocket expenses when accompanying the Client away from their home premises. 3.3 Consistent with the duties of care owed to the Aunt by both or either the Agency and the Client, it is a condition of all Introductions by the Agency that the physical or mental comfort of the Aunt with any tasks she/he is asked to undertake should not unreasonably be undermined or compromised. Aunts must not be placed in any situation which is not reasonably commensurate with their engagement or which places the Aunt at undue personal or legal risk. The Agency retains the right to act to bring an engagement to an end should one or more of the Directors of the Agency reasonably consider that the circumstances could be detrimental to the Aunt. 3.4.1 comply with relevant legislation relating to self-employed personnel. 3.4.2 ensure that they hold adequate public liability insurance (which the Agency expects will be included in the Client’s household cover) against liability for injury and/or loss to the Aunt arising under the Occupiers Liability Act 1957. 3.5 The Aunt works on a self-employed basis and is liable for all their tax and National Insurance contributions; the Client agrees to pay the Aunt directly on receipt of an invoice from the Aunt for each period of work to be paid. 4.1 Aunts must not drive the Client’s vehicle(s) unless covered by adequate insurance, this being the Client’s responsibility, and the Client will be responsible for checking that the Aunt has a valid driving licence and that it conforms to the Client’s own insurance coverage conditions. 4.2 In the course of duty, upon repayment only of running costs, an Aunt may be required to use their car. 4.3 The Aunt’s own car insurance will not cover “hire and reward” and must not be relied upon by the Client or the Aunt in any circumstance where the Aunt may be required to use their vehicle in the course of their engagement with the Client. 4.4 In the event of an accident or any other claim arising from use of a vehicle by the Aunt in the course of duties, neither the Agency nor the Aunt will be liable to pay any uninsured liabilities (including insurance excess). 4.5 Discharge of fines, penalties or other uninsurable exposures sustained personally by the Aunt will be their sole responsibility. The Agency accepts no liability in respect of parking costs, fines or other motoring penalties incurred by the Aunt. 5.1 Save as further provided, the Agency and the Client will treat as confidential all information passing between them. 5.2 The Agency may disclose to the Aunt such confidential information of or about the Client as is necessary and reasonable in the circumstances, unless a specific instruction otherwise has been made by the Client, and in any event without notice where required to do so by law or applicable regulation. The Agency may also disclose to the Aunt confidential information of or about the Agency where required by law or regulations, or voluntarily in the exclusive discretion of the Agency. 5.3 The recipient may disclose confidential information of the disclosing party to any authorised third party where required to do so by law or by any competent regulatory authority. Should this circumstance arise, the recipient shall give the disclosing party prompt advance notice of the disclosure (where lawful and reasonably practical to do so) so that the disclosing party has sufficient opportunity (where reasonably possible) to prevent or control the manner of disclosure by appropriate legal means. 5.4.1 In the event that the Agency sells or buys any business or assets, in which case the Agency may disclose the Client’s personal data to the prospective seller or buyer of such business or assets. 5.4.2 If the Agency or a substantial proportion of its assets are acquired by a third party, and personal data held by it about its Clients becomes or prospectively becomes transferable. 5.4.3 If the Agency is under a duty to disclose or share Agency personal data in order to comply with any legal obligation, or in order to enforce or apply these terms and conditions and other agreements; or to protect the rights, property, or safety of the Agency, the Aunts, its Clients or others. This includes exchanging information with other companies and organisations for the purposes of fraud protection and credit risk reduction. 6.1 No guarantees are given by the Agency with respect to the suitability of the Aunt or otherwise. The Agency operates its own systems consistent with and within relevant requirements and regulations for matching the capability of the Aunt to the requirements of the Client. 6.2 The Client acknowledges the risks inherent in participating in an introductory service and hereby waives all rights to any claim for damages from, and relieve, release, and forever discharge from any claim for damages, any and all of the Agency and any person involved in creating, producing or distributing the Agency service or information pertaining to the Agency service. 6.3 The Agency does not accept any liability whatsoever for the misrepresentation, loss, damage, injury, death, delay, claims or expense of any description arising out of an Introduction. 6.4 The engagement or use of the services of the Agency directly or indirectly, or referral by the Client of any Aunt, whether permanent or temporary, introduced to the Client by the Agency, shall be deemed acceptance of and agreement to these Conditions by the Client. 6.5 In the event of a breakdown, variation or termination of an Engagement, for whatever reason, the Agency will have no obligations to seek or introduce a new, additional or replacement Aunt and will not do so if it considers in its sole discretion that the Aunt has been treated wrongfully or unreasonably by the Client; or where the Client, or their representatives, have not been fully clear about the type of help required; or if the Aunt is required to undertake duties that were not agreed or discussed with the Agency prior to the Engagement. 6.6 An Engagement between the Client and the Aunt will not normally be made without prior discussion between the Client and the Agency and the principal terms and aspects of the Engagement will be provisionally and informally explored; but the Agency will not be the delegate or representative of the Aunt with authority or status to bind the Aunt, contractually or at all, and the terms of the Engagement will be those which are agreed directly between the Client and the Aunt. 6.7.3 in the event of the Client cancelling an Engagement 5 days or less before it is due to commence, make a compensatory payment to the Aunt equivalent to three days’ remuneration and reimburse all expenses incurred by the Aunt upon presentation of receipts. These terms and conditions will be governed by and construed in accordance with the law of England and Wales. Each party irrevocably agrees that the Courts of England will have exclusive jurisdiction in relation to any claim, dispute or difference concerning these terms and conditions and any matter arising from them.